C-Line Letter Size Traditional Polypropylene Sheet Protectors are traditional folded sheet protector that is capable to open on three sides. A black mounting paper is provided to provide a more professional look. Polypropylene material offers acid-free, permanent storage that ensures no materials will lift off from the images. The standard weight protectors offer durable storage for any documents and reference materials, the perfect product for everyday use. You're certain to find a sheet protector that meets your needs, no matter what job you're trying to accomplish. C-Line's sheet protectors are available in a variety of materials and finishes and are designed to protect your documents day after day, no matter how often they're handled. Remember, with all C-Line's top loading sheet protectors-no sheet punching is necessary. The items sent were exactly what I wanted. The service was excellent and the delivery was prompt. I was pleased to find these sheet protectors still available. The few I had left were purchased years ago and I was hoping to find the same ones. Thanks for carrying this product! I have extremely old, delicate documents that will not slide into a single opening page protector without tearing or crumbling. I was thrilled to find these -- they are perfect! The three-sided opening made insertion of the documents easy and worry-free. All of the pages are now protected and safe. So glad I found your company. I needed these sheet protectors on my family history 3-ring binder. Not like traditional sheet protectors, this type does not extend past standrd dividers, allowing you to read the dividers. Once I inserted my pre-punched family history paper into your protectors, it has a nice professional look with the black mounting paper. I highly recommend this product!!! I had to purchase these for a customer. I could not find them anywhere else you guys had them in stock and I received them within 48 hours. And the price was unbelievable!! I love shopping your company if I can't find it anywhere else I know you will have it in stock and at my door in 48hours or less!! I've been using these for years to protect photos and documents. They are durable and high quality. Wouldn't use any other brand! I USE THIS PRODUCT TO PROTECR PHOTOHGRAPHS. I use for scrapbooking. Service was great and so was delivery. Right on time and with a Fed Ex app that came by e-mail. Thanks so much. Welcome to MyBinding Video. 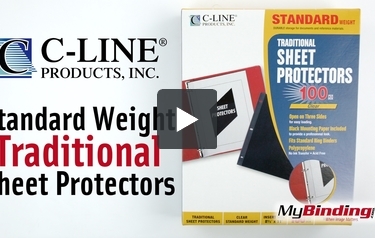 These are the Standard Weight Traditional Sheet Protectors from C-Line. A traditional sheet protector is a folded polypropylene sleeve with a black mounting sheet, all 3-hole punched for standard binders. The poly sleeve is acid-free, offering permanent storage without risk of print transfer. The black mounting paper is to give the page a little weight and a more professional look. They turn easily in binders and present your documents beautifully. There are 100 traditional sheet protectors in this box. For more videos and all your binding needs, visit MyBinding.com.